I am exhilarated after two trips to the East Coast over the past 14 days. Week one, I visited NY and D.C. for two amazing conferences (see last week’s post about that experience here). Week two, I headed back to D.C. with the honor of being invited by the Wine and Spirits Wholesalers Association to traipse around Capitol Hill and tell the LibDib story. Sadly, most of what I know about the inner workings of politics in the United States comes from my love for Veep, The West Wing and the first few seasons* of House of Cards. So, this visit to Capitol Hill was both eye opening and inspiring. Mary Tortorice, Chief Compliance Officer, Sazarac: Mary spoke about Sazarac’s efforts to work with local law enforcement to shut down any illegal second-hand sales of their products online. For example, stopping someone in a private social media whisky group who is reselling a bottle of Pappy Van Winkle Bourbon. There are a lot of reasons to stop this, not just because it is illegal outside of the three-tier system, but because there is a lot of fraud associated with this type of activity. And, with all the news in Mexico about refilled booze bottles filled with potentially life-threatening chemicals, I appreciate Sazarac’s efforts. Nick Rellas, CEO and Co-Founder, Drizly: Nick is another fellow tech CEO/founder. We have a lot in common in that both our companies are trying to bring technology and efficiencies to the three-tier system and help enable consumer choice (LibDib on the wholesale side, Drizly on the consumer side). Except that Nick is 27. And, he started Drizly when he was 22, just out of college. I could be his mother. Literally. Oy. That aside, Drizly is a beautifully built platform that provides delivery of booze in most cities. And I need that in my life, that’s for sure. Paul Fisher, VP of Sales, Intellicheck: Soooooo glad I am not in college anymore. Intellicheck is a phone app that scans ID’s and finds fake IDs. It is 99.9% accurate. Wow. Bummer for the kids trying to get into the bars underage, but since my kids are approaching that age rapidly, I love this product. Erica Johnson, Director of Federal Affairs, Diagio: Diagio has created a virtual reality video called Decisions. It has been viewed over 14 million times and simulates a drunk driving situation. It’s really cool that they are doing this and shows the industry’s commitment to the safe consumption of alcohol. I, of course, spoke about how LibDib is trying to bring small production, craft beverages to retailers and restaurants around the country in a legal and efficient manner via the three-tier system. The audience was young. Which apparently is the norm for Congressional staffers. They work really hard, long hours and are passionate about what they do. They were taking it all in and will go back to their Congressional bosses, reporting about all the cool things the beverage industry is doing to innovate. I hope to be invited back so that we can continue conversations with folks in Washington. 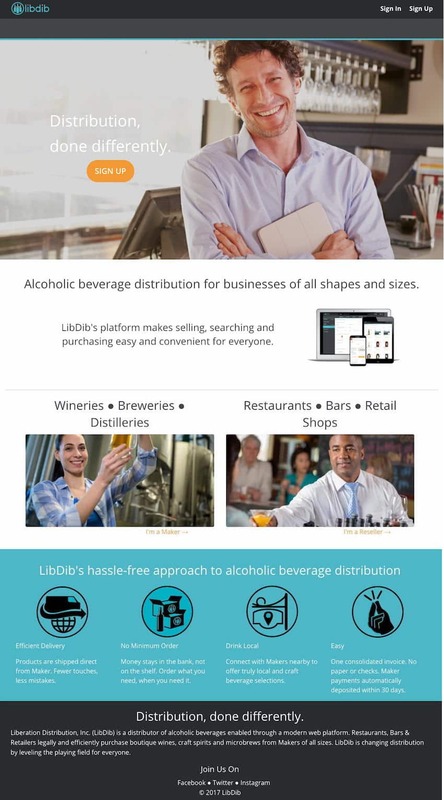 LibDib is all about evolving the three-tier system for small businesses with the help of innovative technology. There are issues on my mind (at rest/hit the dock rules, common carrier licensee to licensee shipping, certain tied house laws) that can be addressed and updated from Prohibition-era standards to modern times. *I had to give up on House of Cards after Season 3. I loved the show, but it just got a little too out there: the killings, crazy Claire, and of course the fact that they were allowed to live in their house after he was elected President. NO WAY THAT WOULD EVER HAPPEN. Instead, I will laugh along with Jonah Ryan, the junior congressman from New Hampshire as he tries to get back in with Selina.